Crossbills, Loxia, with Parrot Crossbill, Scottish Crossbill, Red Crossbill or Commmon Crossbill and Hispaniolan Crossbill and finally Whiteøwinged Crossbill or Two-barred Crossbill. but there is much variation. 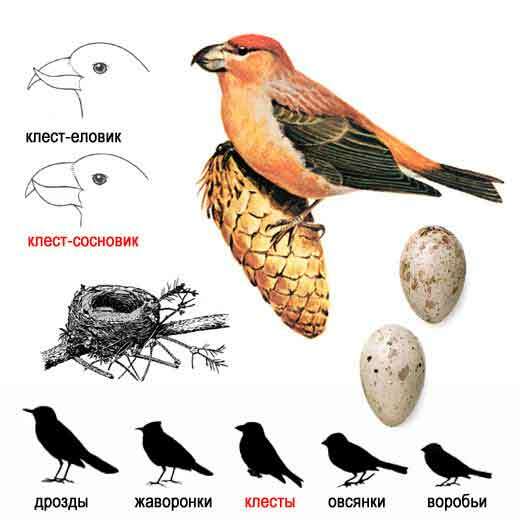 The different species are each birds to specialising in feeding on different conifer species, with the bill shape optimised for opening that species of conifer. This is achieved by inserting the bill between the conifer cone scales and twisting the lower mandible towards the side to which it crosses, enabling the bird to extract the seed at the bottom of the scale with its tongue. 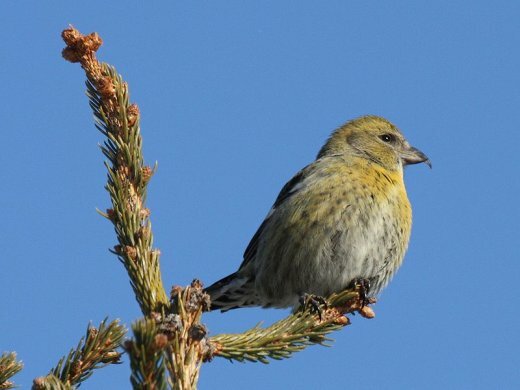 in Scotland, adding to the difficulty of distinguishing it from Common Crossbill and the endemic Scottish Crossbill, both of which breed within its range. of the seeds from the cone. The Parrot Crossbill is a specialist feeder on the cones of Scots pine. Male Parrot Crossbill (Loxia pytyopsittacus) sitting in a Spruce tree. This species is difficult to separate from Common Crossbills and Scottish Crossbills, and plumage distinctions are negligible. The head and bill are larger than in either of the other species. The bill is thicker than those of its relatives, and the crossed tips are often not readily apparent. Extreme care is needed to identify this species. The deeper, harder choop or tyuup call is probably the best indicator. them is still at a very early stage. vertebrate unique to the United Kingdom. 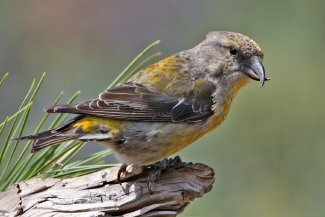 The Scottish Crossbill was confirmed as a unique species in August 2006, on the basis of having a distinctive bird song. 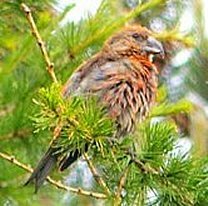 Research in Scotland has shown that Common Crossbills, Parrot Crossbills and Scottish crossbills are reproductively isolated, and the diagnostic calls and bill dimensions have not been lost. They are therefore good species. The population is thought to be less than 2000 birds. It nests in pines or other conifers, laying 2-5 eggs. 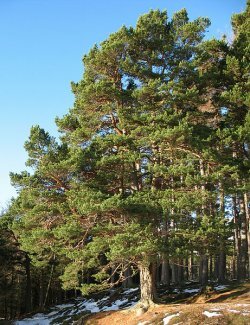 The Scottish Crossbill breeds in the native Scots pine, Pinus sylvestris, Caledonian forests of the Scottish Highlands, but (perhaps surprisingly), often also in forestry plantations of exotic conifers, notably Larch (Larix decidua and L. kaempferi) and Lodgepole pine (Pinus contorta). This species of crossbill is resident, and is not known to migrate. 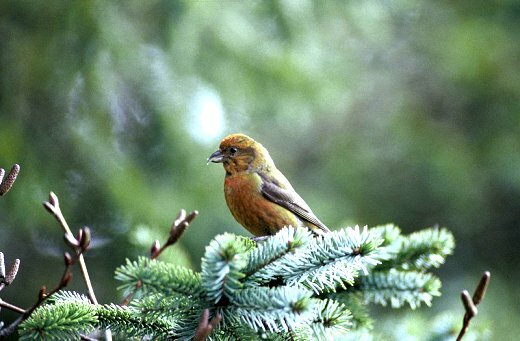 It will form flocks outside the breeding season, often mixed with other crossbills. 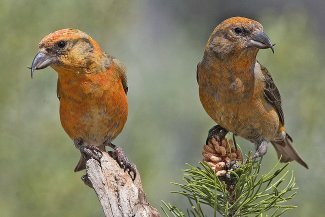 The crossbills are characterised by the mandibles crossing at their tips, which gives the group its English name. They are specialist feeders on conifer cones, and the unusual bill shape is an adaptation to assist the extraction of the seeds from the cone. 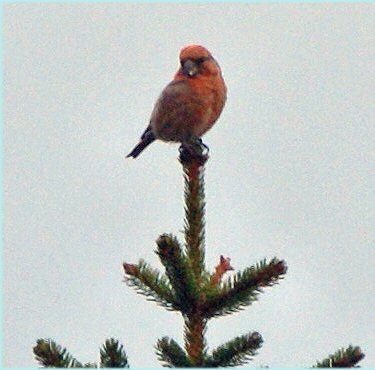 The Scottish Crossbill appears to be a specialist feeder on the cones of pines (Scots pine and Lodgepole pine) and larch. The Scottish Crossbill is extremely difficult to separate from the Common and Parrot, and plumage distinctions are negligible. The head and bill size is intermediate between and overlapping extensively with the other two, and extreme care is needed to identify this species. The metallic jip call is probably the best indicator, but even this needs to be recorded and analysed on a sonogram to confirm the identity. in certain areas of all three continents, and in North America, also in Douglas-fir. This crossbill is mainly resident, but will regularly irrupt south if its food source fails. This species will form flocks outside the breeding season, often mixed with other crossbills. species, also feed on Douglas-fir and various pine species. there are a lot of sub-species. Their names can be viewed there. 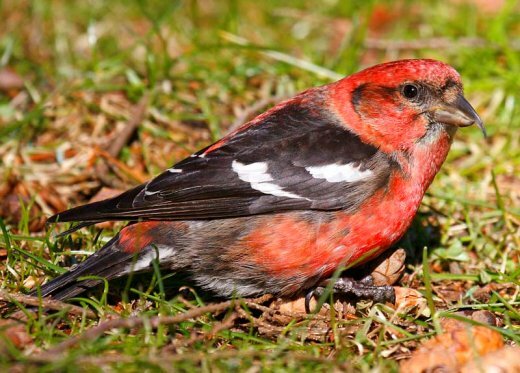 The Two-barred Crossbill, Loxia leucoptera, known as the White-winged Crossbill in North America. It has two subspecies, White-winged Crossbill, Loxia leucoptera leucoptera in North America, and Two-barred Crossbill Loxia leucoptera bifasciata in NE Europe and N Asia. This bird breeds in the coniferous forests of Alaska, Canada, northernmost USA and across Asia extending into northeast Europe. It nests in conifers, laying 3-5 eggs. This crossbill is mainly resident, but will irregularly irrupt south if its food source fails. The American race seems to wander more frequently than the Eurasian subspecies. This species will form flocks outside the breeding season, often mixed with other crossbills. It is a rare visitor to western Europe, usually arriving with an irruption of Common Crossbills. Tsuga canadensis) and White spruce, Picea glauca cones. Adult males tend to be red or pinkish in colour, and females green or yellow, but there is much variation. and this species occur, but some care is still needed. 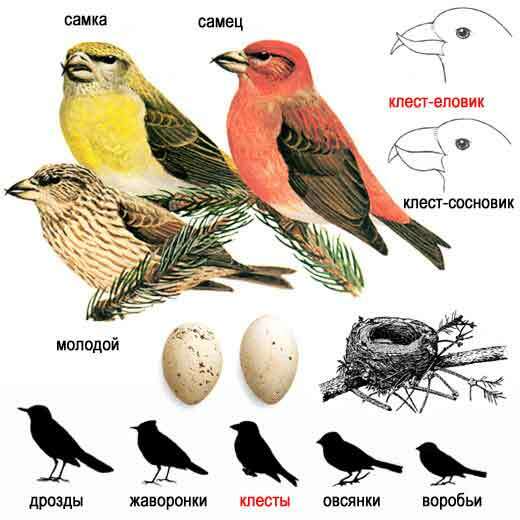 Within its Eurasian range, this species is smaller-headed and smaller-billed than Parrot Crossbill and Scottish Crossbill, so the main confusion species both there and in North America is Common or Red Crossbill. and scientific names. There are also white tips to the tertials. The adult male is also a somewhat brighter (pinker) red than other male crossbills. Some Common Crossbills occasionally show weak white wingbars, so care is needed with the correct identification of this species. The chip call is weaker and higher than that of Common Crossbill. 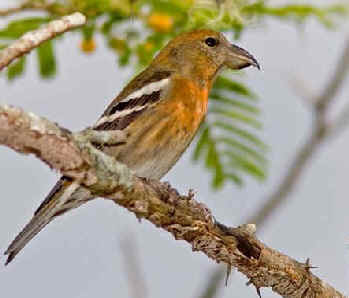 The Hispaniolan Crossbill, Loxia megaplaga, is a crossbill that is endemic to the island of Hispaniola in the Caribbean and therefore only found in Haiti and the Dominican Republic. The bird feeds almost exclusively on the seeds from Hispaniolan Pine (Pinus occidentalis) cones. black wings. Female dull olive with blackish wings, yellowish rump and breast, and fine dark streaking on breast. groups. Regularly visits water to drink. Loxia megaplaga occurs primarily in Haiti and the Dominican Republic, where it was not recorded from 1930-1970. Several birds were found in the Blue Mountains of Jamaica in the early 1970s, but there have been no subsequent records. In Haiti, it is known from the Massifs de la Selle and de la Hotte, including the Macaya Biosphere Reserve where small flocks were recorded in 2004.
availability but was estimated as c.3,375 individuals following surveys in the Sierra de Baoruco between 1996-1999. It is restricted to pine Pinus occidentalis forests, mostly at high elevations, and feeds exclusively on pine-seeds. There is a large pine-cone crop about every three years, but crops in other years are small or fail altogether. Fluctuations in pine-cone abundance are not synchronous, and birds are nomadic in response to food availability, the species has been recorded as low as 540 m and as high as 2,600. It breeds between January and April, with the timing probably depending on the cone crop. The nest is usually built high up in the branches of pine trees. IUCN Red List for birds. 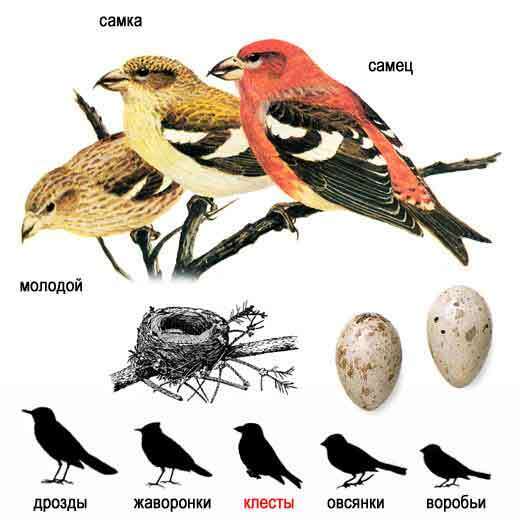 Downloaded from http://www.birdlife.org on 15/02/2012.